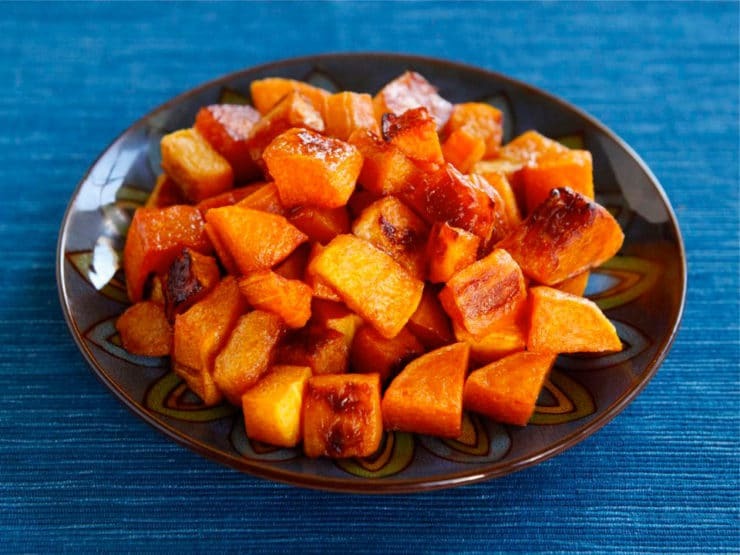 Maple Cinnamon Roasted Butternut Squash – Easy, healthy, delicious vegan recipe for fall. Includes link to a detailed tutorial on how to peel and seed butternut squash. One of my favorite things about autumn is the abundance of seasonal squash in the market. Butternut squash is a particular favorite in our family. It’s naturally sweet, low in calories, and full of vitamins A and C. I’m always looking for new ways to prepare it. 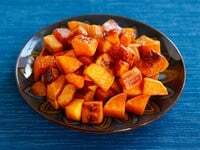 In this very simple recipe (which I included in my own Rosh Hashanah menu this year), I tossed butternut squash cubes with olive oil, maple syrup and seasonings to create a sweet, salty medley of flavors. The cinnamon and cayenne give it a little spicy kick– just enough to make it interesting. 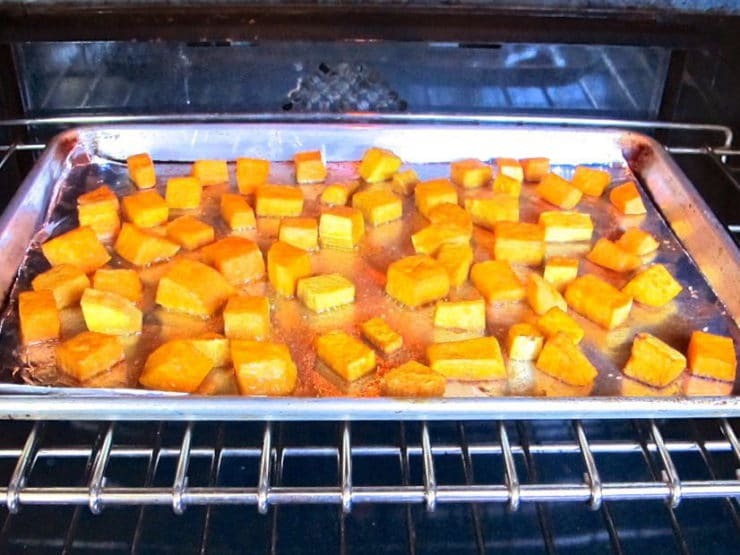 It may seem like a lot of squash, but when roasting the pieces tend to shrink up a bit. It’s so delicious, you’ll be glad you made the extra. If you’re only making dinner for two, you can easily halve the recipe if you wish, but I could honestly eat half the recipe by myself in one sitting. It’s that tasty. You don’t need to pay a premium for pre-peeled and seeded butternut squash, though it certainly is convenient. It’s not that hard to prepare a butternut squash yourself. Check out my All About Butternut Squash tutorial for details and more recipe ideas. The post also talks a bit about the history of squash, because my inner food nerd loves to share these kinds of things. 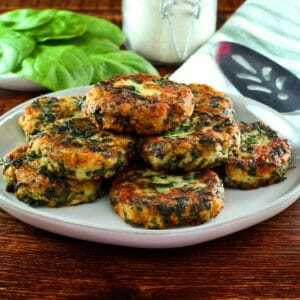 This recipe is vegan, pareve, gluten free and really healthy. I’m thinking it might be a great addition to a Thanksgivukah holiday spread, too. Enjoy! Easy, healthy, delicious vegan recipe for fall. Includes link to a detailed tutorial on how to peel and seed butternut squash. Preheat oven to 425 degrees. 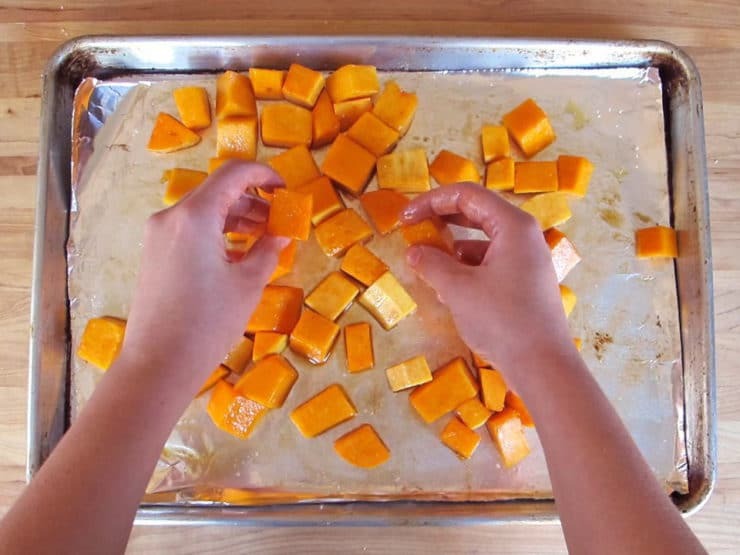 If you are breaking down a whole butternut squash for this recipe rather than buying the prepared, peeled cubes, you will need a large squash (or two smaller squashes) totaling about 3 lbs. 3 oz. in weight to produce the correct amount of peeled cubes. For details on how to prepare squash for roasting, see this post. Line 2 baking sheets with foil (optional-- protects baking sheet when the sugars caramelize so it won't be sticky/hard to clean). Spread out the cubes on the baking sheets. 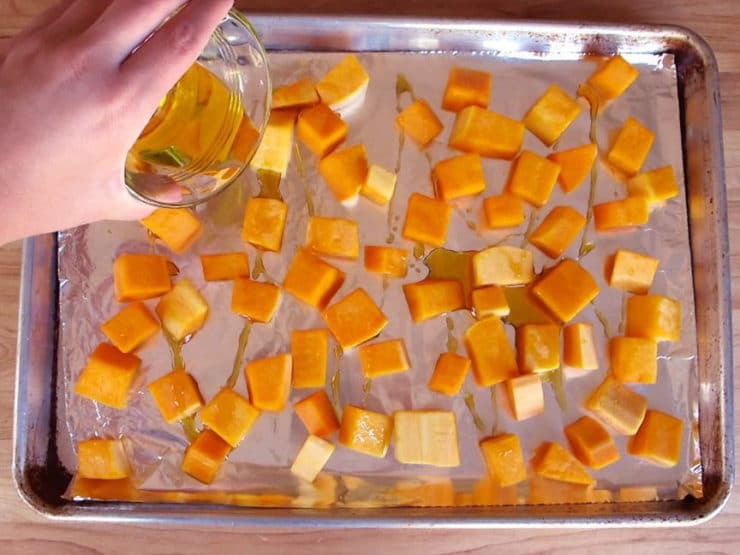 Drizzle the squash on each baking sheet of squash with 1 tbsp olive oil and 1 tbsp maple syrup (2 tbsp olive oil and 2 tbsp maple syrup total). Sprinkle each baking sheet evenly with 1/4 tsp salt, 1/4 tsp cinnamon and a pinch of cayenne (1/2 tsp salt, 1/2 tsp cinnamon, 2 pinches cayenne total). 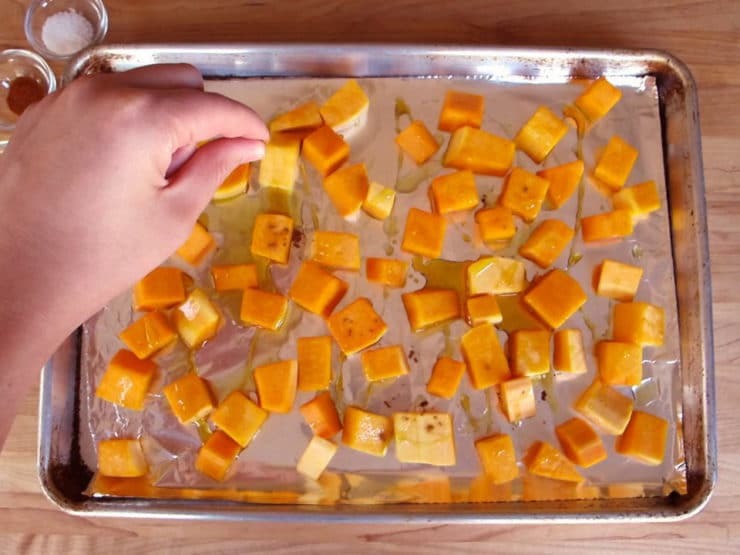 Toss the squash on the sheets with clean hands to coat evenly. 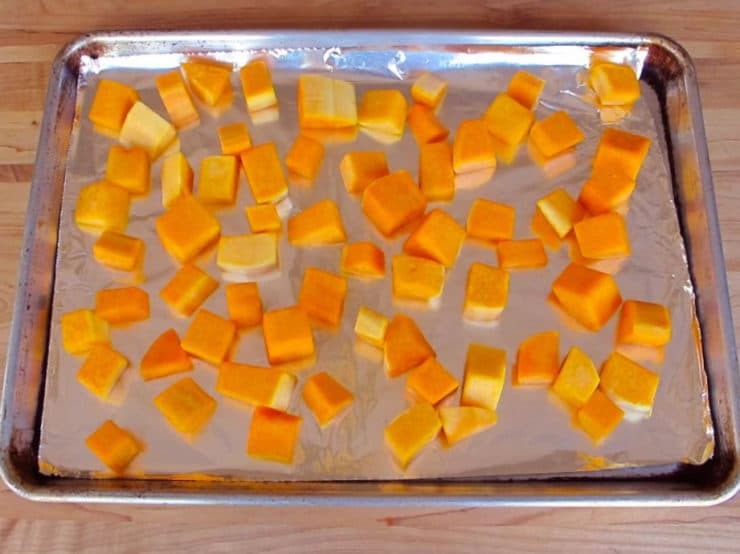 Roast the sheets of squash for about 30 minutes, switching the baking sheets on their racks halfway through cooking, till the largest piece of squash is tender all the way through. Remove the baking sheets from the oven and turn on the broiler. Take turns placing each baking sheet under the broiler for 1-2 minutes longer to caramelize (the squash should be golden brown-- careful, it will brown very fast-- don't let it burn!). Serve warm. This recipe sounds amazing, I’m trying it out tonight! I do have a question that I hope you can help me with. Recently, my family(myself included) made a lifestyle change; we’ve gone “all natural/organic”, as well as started a diet based on calorie intake. So far, every cooking/recipe site I have visited has failed to tell me how much a “serving” is. Some sites(yours included) tell me how many total servings are in the dish (ie: 6 servings at 144 calories per), so with this information I can guesstimate. But I have yet to see one recipe that tells me “90 calories per serving, 1 serving = 1/2 cup”. Is there a general rule of thumb as to how much a “typical” serving is? No there is not a rule. 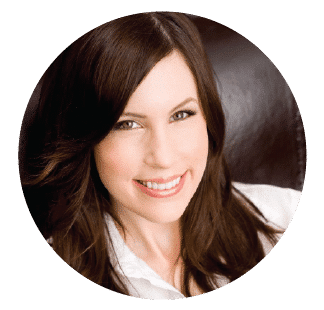 Calorie calculation is a newer feature for sites like mine, and I am working through my recipes to determine what an exact serving size is for all of my recipes. Understand that this requires me cooking the recipe again and measuring out an actual serving. With close to 1,000 recipes on my site, it takes some time. Those that have been updated will show serving size in the recipe notes. This is sooooo good. Easy to make and simply delicious. I’ll be making this again very soon!! Delicious! I’m looking for recipes to add variety to my family meals, and this was perfect. Wow 😲 This was really Delicious 😋! Thanks for sharing this recipe… will make it again!!! How far ahead can this recipe be made, and how should it be reheated? (Trying to prepare as much as possible ahead of Thanksgiving so I’m juggling fewer side dishes the day of.). Thank you!! Hi Ginny, you can make it about an hour ahead, but roasting it just before serving will maintain any crisp edges… if you roast ahead of time you may lose those as it sits due to the squash’s moisture. It will still taste great though. You can reheat the squash on a lightly greased or parchment-lined roasting sheet at 350 degrees F for 10 minutes or so until heated through. These were absolutely awesome!!! 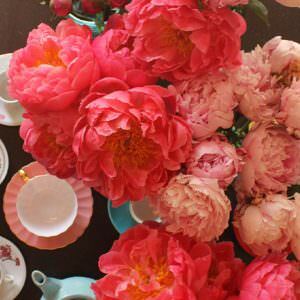 My husband loved them!!! Best roasted squash recipe I’ve ever made! I simplified the prep by putting the cut-up squash, oil, syrup, spices in a large ziplock bag & mixing them around until well coated. Then I dumped them out on to the parchment paper, spread them out a bit from one another & baked. I needed 35 minutes to cook. I re-stirred them in the liquid of the pan & then broiled. Fantastic….almost dessert!!! My guests ate every bite & were looking for more! I followed the directions to the letter but the squash stuck to the foil and the broiler burned the tops and set the fire alarm off. I agree with Deby that all sides should be coated before any of it goes on to the pan. Very good, but stuck to the foil in spite of xtra oil. Thanks for the recipe. I especially liked your link re how to peel a squash. My squash cooked very quickly; when I checked it at 30 minutes it was very mushy. I then put it under the broiler and watched it carefully but I can’t say it really carmelized. When it started to char I took it out. If I make this recipe again, I will start checking for doneness at about 15 minutes. I would probably also kick up the seasoning–for my palate, it was very mild. Made this today… to bring to a friends house. It came out amazing! I added some toasted walnuts in the end.. Definitely going to make again! Toasted walnuts are a great addition! After 30 minutes, my butternut squash was completely burnt (blackened/charred). That has never happened to me. I wonder what I did wrong. Has anyone else had that issue? I’m still giving 5 stars because I don’t think it was the recipe fault for burning the squash. My squash has never been this burnt. It must have been a fluke. That is really odd Heather, especially since so many others have had it work out at this temperature. Sorry to hear it didn’t work out. It’s possible your oven runs hotter than others. You might want to test it via an oven thermometer to see if something is off, heating elements can malfunction. Also whenever roasting anything I always recommend checking it every 10 minutes or so. My family likes this recipe. This was our first experience cooking butternut squash! My husband asked me to save the recipe! Very good,will cook again. Agree, the prep time was about 30 minutes. Kept changing my knife to get the task done. It was worth it! ah but they used pre cut squash in this recipe. presidents choice has them fresh or find them in the frozen isle. I actually poke my squash with a knife a few times & then put the whole squash in the microwave for 5-6 minutes. Not long enough to cook it but enough to soften it for cutting. This also cuts down on the roasting time. Every time I do this it comes out great plus it saves my older hands from having to try & cut it raw. Made this today and brought it to a potluck with my children’s homeschool group. It was a hit! So easy to make and so delicious. Added some cranberries when it came out of the oven and it will now be a staple at our house! Thank you! I made this recipe just as written and it was really delicious, sweet and savory with a nice kick from the cayenne! I think I will actually up the cayenne level next time I make it since I like spicy flavors. I bought the pre-cut squash and used the foil on the pan as suggested, made prep and clean up a breeze. Thanks for sharing this recipe, I think the maple glaze might be good on sweet potatoes too, will give that a try! Great, receipe. I’ll be trying it tonight. I would suggest tossing the cubes in a large bowl and then placing them on the tray, so they are coated evenly. I tossed them right on the tray and then rinsed my hands!! They came out pretty even! Also delicious! I didn’t have to put under the broiler – just turned off the oven and let the squash sit a few minutes while I dished up the rest of the meal – perfect. This recipe is so good, even my husband was eating the roasted butternut squash direct from the pan, and he’s not a veggie person. Thanks for sharing the recipe and instructions on how to peel the squash! Absolutely delicious!!! Even my husband loves it and requests me to make it. Delicious, so delicious! In case you are short on time, you can microwave the cubes a few minutes first before following the recipe. You’ll have to watch for done-ness sooner, of course. You can also skip the broiling step. DELICIOUS!! Made this the other night for guests, and everyone loved it. Only difference was that it cooked MUCH more quickly that the recipe suggests. When I checked the squash at 15 minutes to switch the pans, it was already done. Just had to brown it – really good. Agreed!!! My cubes were done with 13 mins remaining on the timer!! So… About 15-17 mins and ready!!! My fault most burned under the broiler, but 5 minutes prep time is totally unrealistic for those attacking a butternut squash for the first time. More like 30 minutes despite the ‘how to’ videos I watched. And I am not a novice cook. You’d have to be a ninja to cut, peel and dice in 5 minutes. Just a warning for timing dinner. I almost cut my fingers off cutting and peeling….oh geeze…and let alone the time, strength, and effort it takes …even with the chef knife I used!!! I agree totally!!! Try also making B’nut squash soup. Just bake the two halves (after removing the seeds). Then scrape out the flesh, put it in a pot, add chicken or vegetable stock and anything else you might like, though your kids will probably love butter, apple juice, brown sugar, etc. B’nut squash is very forgiving in that regard and I guarantee you (as well as they) will love it no matter what you may put in or leave out!